For young women, it's more important that their work is fun than lucrative, according to a survey by the New Work Project. Young men, in contrast, want fun and money in equal measure. But when women hit 35, priorities change. Women in their career boom-years place fun at the same level as salary, just like men 10 years younger. So far, 12,000 people have completed the questionnaire, which in one section asks respondents: "In three words, describe your ideal working arrangement." For women between the ages of 25 and 34, "fun" is clearly the most popular keyword, followed by "money," "rewarding," "hours," "fair," "home," "challenging," "relaxed" and "supportive." Between the ages of 35 and 44, things switch around a little. "Home" takes the crown for working women, followed by "fun" and "money," trailed by many of the same descriptors, except "relaxed" falls down the rankings, beaten by "friendly," "productive," "secure" and "family time." The reason for that is simple, according to Dr. Lara Sherbin, the director of research at the nonprofit think tank Center for Work-Life Policy (CWLP): "When you hit 35 you probably have a mortgage." Members of this age group, known as Generation X, are reaching the point where they're saving for their children's college education, paying that mortgage, and realizing that "you're going to retire at some point and should probably start saving for it." Men between the ages of 20 and 24 are all about the "fun," but at 25 money becomes an equal goal and stays that way until age 44, at which point money zooms way ahead. Women at 45 also ditch "fun" as an ambition, but the desire for money is matched by a desire for "home," along with what's "secure" and "fair." 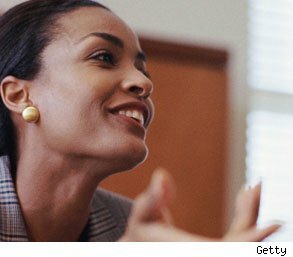 A study on Generation Y (the under-34 set) by CWLP found that while more of its men were concerned with "being highly compensated" (91 percent to 88 percent), its women were actually more worried about paying off student and credit card debt (74 percent to 69 percent, and 79 percent to 68 percent, respectively). Young women in general prioritize fun over money, expect to earn less money and also make less money. A survey of students at Europe's top colleges found that women expect to earn, on average, 21 percent less than what men expect. This may be one of the reasons why women earn, on average, 17.5 percent less than men in the European Union. The same phenomenon has been found stateside. A May study by the John J. Heldrich Center for Workforce Development at Rutgers University found that of the nearly 600 recent graduates polled, men were out-earning women by an average of more than $5,000 a year. Why should women care less about money in those early working years -- a time that can have a serious, accumulated impact on lifetime earnings? According to Sherbin, men and women see recognition very differently. While the sexes crave recognition equally, men see it as tied more to salary. "Women want the 'thank you's,' " she says. "The appreciation." There is also trend among the young cohort to take a more holistic view of the value that they're getting from their jobs. "Generation Y looked at how their parents lived, and are saying 'I don't want to do that, i don't want that life for myself,' " Sherbin says. This is why, she says, "Google-ized environments" have become such popular destinations for young people. "They want the the beanbag chairs, the flamingos." Women take this to more of an extreme, she adds. They focus less on the salary and more on the ability to give back to the community, the intellectual stimulation of the work, the right team setting, the right colleagues. And at a slightly older age, working women are "recalibrating their decision to leave their children almost every morning. There has to be something else besides a paycheck to get them to do that." The CWLP study found that more women than men considered it important that their work "gave back" to the world or their community. In the boomer generation, that difference was 90 percent to 79 percent. For Generation Y, that gap closed ever slightly. This difference was also apparent in the European Union study. Men not only expected higher salaries, they also had a stronger desire to be a leader or manager, and cared more about prestige. A quarter of men wanted a position with high levels of responsibility, compared with 17 percent of women. The female students, on the other hand, placed greater importance on working for a company with high corporate social responsibility and ethical standards. These preferences may underly the over-representation of women in the public and nonprofit sectors, and their near invisibility at the highest rungs of the for-profit sector. Women also volunteer more than men, across the board, and give more to charity at every income-level. Men may also feel a greater pressure to earn money, to be the breadwinner, as this is how society has functioned for so long. "Thirty-nine percent of women now out-earn their husbands in the economy. They're increasingly becoming the primary breadwinners," says Sherbin. "But that means 61 percent of men still out-earn their wives." Next:You Want A Promotion, But Do You Deserve One?